Donald Taglialatella is pleased to announce the fourth collaboration and eighth individual print project between World House Editions and the highly influential multi-media Swiss artist John Armleder (b.1948). For this new edition, a silkscreen, John Armleder collaborated with Luther Davis at Axelle Editions in Brooklyn, New York to create his most recent work in the print medium. Entitled Ancient Imperial Horses, the large, 40 inch (101.6 cm) square print is an extremely captivating and highly optical image from the artist’s “Dot” series. 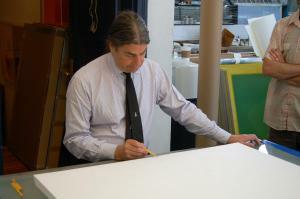 John Armleder has been using the dot motif since the late 1970s and they can be found in the artist’s paintings, drawings, prints and even multiple objects. Clearly paying homage to such avant-garde artists as Francis Picabia, Alexander Rodchenko, Larry Poons and even Thomas Downing, John Armleder, through his notion of appropriation, has raised the simple, optical concept and arrangement of dots from a pure mode of abstract pictorial composition to a systematic concept of representation and perhaps even structural analysis. Ancient Imperial Horses by John Armleder will be officially released to the public and featured at the World House Editions stand at the IFPDA's 2014 edition of the Print Fair, from 05 - 09 November in New York. The collaboration between John Armleder and World House Editions dates back to 2003.